When all goes well my front yard border looks like this! I live in northern Minnesota and garden in Zone 3. This is what my border looks like today. Many of the perennials are very small, and some of the later summer bloomers are barely breaking ground. I have added my junk, and will be filling in the border with annuals. Starting at the far left of my kidney shaped flower garden, I have diagrammed the emerging perennials and started filling in the gaps with greenhouse packs of annuals. The goal is to start short in front and have a gradual progression to tall in back. Not perfectly mind you, but that's the goal. Moving right, I am filling in around the perennials with more alyssum, white trailing verbena, and new this year Bunny Tails grass, and in the galvanized trough, pink Marguerite daisies (instead of yellow). I like the movement of annual grasses, so recently have been using them in both beds and pots. The center section of the border has my trademark stepladder. Here in front and to the left of the ladder, I will be filling in with more alyssum and red trailing verbena. The stepladder has pots of calibrachoa and Diamond Frost. Now at the far right of the flower bed, I have added a new wire basket (cloche) in 2014. Also added the milk can top with a very large Sempervivum. This is the second year in a row that my Gardenview Scarlett Monarda has not survived in this bed. Last year I dug up some Monarda from a back bed and added it but this year I have none. That darn Polar Vortex is hard on my Zone 4 (and above) perennials! Plan A: Get a clump of my Monarda with neighbors that I have shared with. Plan B: Buy tall annuals to fill this spot for this year. There are not many available at the greenhouses. I did see Cleome. Plan C: Plant yellow Marguerite daisies in a container of some kind to add some height. This is the backside of the border. Sometimes it's hard to believe that these larger perennials fill in the gaps in back by the end of June. Continuing along the backside. The Russian sage is barely starting to leaf out. This is year three. Purple coneflowers are quite small yet too. Now to put the annuals in the ground. I turn the dirt over with this fork, being careful not to disturb the perennial roots. Here I am breaking up the soil with the fork. I use a hand spade to dig holes for the alyssum. I always plant multiple alyssums in each hole. At least 2-3 plants from the 6 pack. I like clumps not a single file line. Then I added the verbena as well. The annuals are added to the left side of the border. On the stool (new in 2014) is a kettle of trailing Bidens. The funnel on a broomstick is planted with Lantana. It is important to added vertical interest with plants and some junk too. The rest of the fill in annuals have been planted. I have stirred up the dirt around the established perennials too to aerate them some. The laundry tub with my wire cloche is planted with nasturiums. Still hoping to find some Monarda for the bare spot. I also have a few more alyssum plants to fill in any bare spots in the front of the border. My border is planted for 2014. I am still trying to find a clump of established monarda for my bed. I can buy one but it will not be much of a show stopper in 2014. I would still have to put in some annuals for this year. I am hoping to get one from a neighbor or from our church's perennial sale next Saturday. Wish me luck! Update: July photos of 2014 garden! Charlene, your flower bed is going to look terrific. Last year's was so pretty. It's hard to imagine that your flowers are just now starting - mine have been in bloom almost all year since we didn't have a winter. 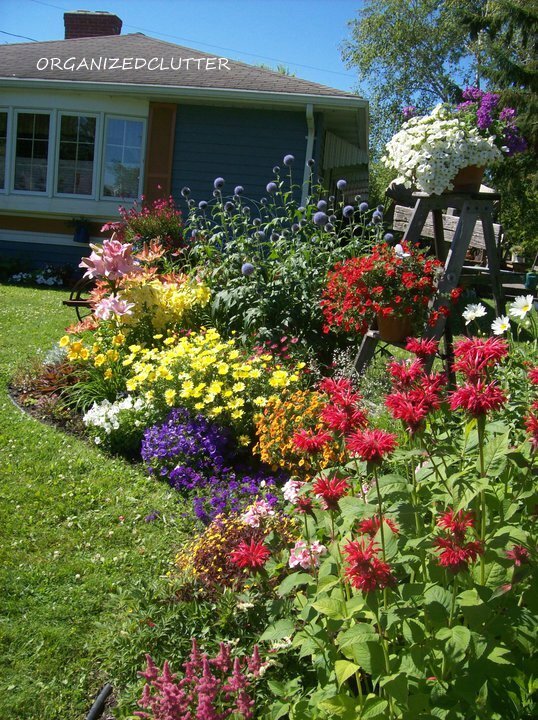 Looking forward to seeing your flower bed when your flowers fill out. Great photo's. Hi Carlene! Oh, that first snap of your flower bed is so beautiful! I'm sure your new little plants will thrive. It's obvious you have a green thumb. Love all the variety you've used too. Hi Carlene! A fellow MN gardener here . . . I love seeing how you have added heights and varied the level of your plants in your garden. Very clever and something I can emulate. Look forward to seeing your gardens and home develop again over the summer. Thanks for your inspiration!!!! Wow, your garden is really behind! What a year for bad weather this has been. Love your combination of plants, planters and that stunning birdhouse! I'm thrilled that winter is over!!!!!!!!!!!!!!!! I love your "map" of the garden. Great idea! So beautiful Carlene ... I guess good planning and knowing what each plant will do is what it takes to get that great look. Thanks for sharing you talent for creating this beautiful look. I like your plan, Carlene! How do you keep your perennials from spreading all over the place? My monarda and black eyed susans have taken over my perennial bed. I think I've lost all of my purple and white coneflowers. : ( At least the warm weather is finally here! Well with the winter you guys (and us here in Chicago) had -- isn't it a wonder ANYTHING survived!? I got most of my herbs back but a few perished as did some of my other perennials. I love how your spot looks after it's all filled in -- the ladder and all of the little accent pieces really set it off! I absolutely love your border garden. I do have a question though. How do you keep your " clutter" in place say if a good wind comes up and blows the ladder over, etc. I live in IL and it can get pretty windy especially with storms. Again, I love your"organized clutter". It is so welcoming. This flowerbed really turned out well. I was going to offer you some raspberry wine monarda seeds from my own plants from 2013 but see you already have some established. Is that Jacob Cline? Now you can come to Md. and help me put my beds together like yours. LOL! Thank you for sharing your beautiful garden !! I LOVE that you labeled everything and showed us each plant, it makes it easier to copy cat your beautiful bean shaped garden. In your zone, would delphinium's work in place of your bee balm, or maybe a climber vine with another ladder ? cleome is amazing though and easy to start from seeds. I love your style and décor , I hope you continue to share your gardens and great junky ideas !! I have had delphiniums but they were always full of aphids so I dug them out. I have had cleome too. I almost bought some of them this year. I also had sunflowers one year and as soon as they came into bloom the squirrels chewed the heads off and dragged them away! Omgosh, Im sorry but that picture in my head of the squirrel getting that big sunflower head made me laugh out loud, what a lot of work ! Thanks for sharing that garden story I bet you have a ton of good stories !